Former Florida Gov. Jeb Bush, a potential 2016 Republican presidential contender, is doubling down on his support for the Common Core education standards, despite the objections of many conservatives. “In my view, the rigor of the Common Core State Standards must be the new minimum in classrooms,” Bush said Thursday in the keynote speech at the National Summit on Education Reform in Washington, the Washington Times reported. An August Gallup poll found 59 percent of Americans said they oppose Common Core. In a party breakdown, 76 percent of Republicans oppose the standards, while only 17 percent of Republicans support them. Can schools use a parent’s opposition to Common Core against them? Is there an attempt to prevent parents from learning about the data collected on their children due to Common Core? In the case of a Nevada father, one or both of those scenarios seem to be exactly the case. John Eppolito is a former educator. He is now a real estate agent in Lake Tahoe by day and a very active Common Core opponent at night. He leads a group called Stop Common Core Nevada and is well known in his area for his fierce opposition to this federal takeover of the education system with national standards. Beyond that, he is very concerned about the collection of data regarding every student and exactly what happens to that data. Due to these concerns, he approached Nevada’s Department of Education about the data collected on his four children. Since there is nothing, at least right now, that can be done to stop collection of the data, he wanted to know exactly what data about his children the district is keeping. The state agreed to comply with his request, but said it would cost him a fee. They also told him there was no way to run custom reports on students, so in order to get the information he requested, he would have to pay for programming and the running of a custom report. The total amount, they said, would be $10,194. A fifth grade worksheet in Florida declares that the Federalists were different than the anti-federalists because they “believed in a strong national government that would have power over the states.” The Federalists believed in a central government, but it was to be a “limited government.” The anti-federalists believed that there should be no central government, and pushed for full sovereignty of the states. 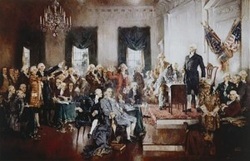 The Federalists, according to the worksheet, included “John Adams, George Washington, Benjamin Franklin, James Madison, John Jay and Alexander Hamilton.” While it is true that the Federalists wanted a central, or a “general,” government, the worksheet does not stress how important it was to the Federalists to ensure that the government did not become too powerful. Both the Federalists and the Anti-Federalists were dedicated to a system where government would not become tyrannical. This is evident to anyone who reads the words of the founding fathers. But in the worksheet, the phrases “checks and balances” and “separation of powers” are forgotten. The meaning is much different when the full quote is revealed. Although Franklin indeed went on to endorse the Constitution, it is clear that he was well aware of the potential for tyranny in the government. The worksheet is a part of Florida’s “sunshine standards,” which were established after Common Core state standards became politically toxic. The anti-Federalists eventually came around to the idea of a general government, and their input was pivotal in establishing the Bill of Rights. But it seems that some educators and others attempt to portray the Federalists as big government and the anti-Federalists as “anti-government,” which is grossly inaccurate, as both groups agonized about how America could prevent the inevitable tyranny that eventually occurs in all governments, everywhere. This truth is evident to anyone who reads the Federalist papers. The Federalist papers can be found here. The anti-Federalist papers can be found here. Kimball added that the new standards are so controlled that — rather than just being given the material to teach — teachers are given “scripts” to read, as well. She said if a student responds to a lesson with a certain question, teachers are told to read a corresponding line from the script. She also said educators have no power to alter the curriculum to cater to the needs of students who learn differently. I’m wondering when David Coleman, the man behind the Common Core curtain, has had the time to basically rewrite American History. He’s been a busy man; architect of the Common Core, president of the College Board, aligning the SAT to the Common Core. You know, if you’re going to ruin American education, you might as well go for the gold and reinvent history. And why not? If you’re David Coleman, the most prominent man in education that people all over still haven’t heard of, you have carte blanche! In the fall of 2014 close to a half million high school sophomores and juniors will be learning from a new set of AP history standards, Coleman-style. Contrary to what you may have heard, there are many organizations that are involved in Common Core that also stand to gain a lot financially with its implementation nationally. Of course, these groups will tell you that their involvement is simply to provide a great education platform that will increase the learning curve of all of our children. Nothing cold be farther from the truth. This is nothing more than a plot and ploy to amass more money and essentially, control and information on our children and push toward the UN and control internationally. It’s wonderful to see all the protests around the country against standardized testing. At Garfield High School in Seattle, Washington, teachers are refusing to administer the Measures of Academic Progress. In Texas, hundreds of school districts have passed a resolution saying standardized tests are ”strangling” public schools. The National Resolution on High Stakes Testing, which calls on government officials to reduce standardized testing, has been endorsed by hundreds of organizations and over 13,000 individuals. And yet, in spite of all this, testing is still putting a wicked half-Nelson on students’ curiosity, creativity, and passion for learning in tens of thousands of classrooms around the country. Just in case you are in a position as an educator to influence public policy on this issue, here is a list of 15 reasons why standardized tests are worthless—utterly worthless! Common Core has divided the state’s Republican coalition. Tea Party groups and other organizations on the right wing of the Alabama GOP have accused the standards of undermining local control of curricula and expounding what they consider anti-American propaganda. Business groups, joined by the Alabama State Department of Education and education groups, says the standards will provide the best training for students, and say repeal would significantly harm schools and throw teaching into chaos.